← TIPS vs. I Bonds: Best move for small investor? Would you buy an investment that was absolutely guaranteed to lose money? No ifs, ands or buts: This sucker will make you poorer! How’s that sound? You might think this is a crazy question. You’re probably thinking, who would choose to own an investment that is guaranteed to lose money? Arends argues that buying a 10-year TIPS with a base interest rate of less than 1% – or a 5-year with a base yield dipping into the negative – is ‘crazy, totally nuts.’ He also points out that the Consumer Price Index is a lousy way to measure inflation. I agree with and understand his points. My criticism: Arends doesn’t offer an investment alternative for the super-safe portion of your portfolio. And that is the problem. Would you rather buy a 5-year CD at the local bank, now paying about 2.4%, or have a Treasury instrument (no state income taxes) that pays the rate of inflation minus 0.18% (the rate of the last 5-year auction)? At the least, it is a tossup, since the TIPS has inflation protection and the CD doesn’t. Would you rather buy a conventional 5-year Treasury today, now paying an absurd 1.78%? That is an easy choice: I would go with the TIPS in this case. 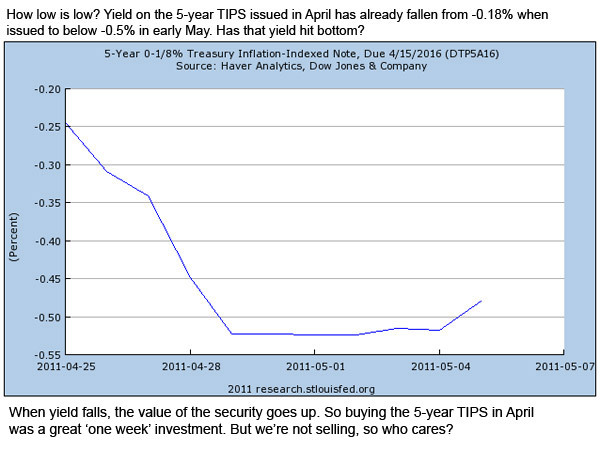 The inflation protection is a lot more valuable than getting 1.78% on your money, which is highly likely to produce a real return well below the -0.18% of the April 5-year TIPS. The reason TIPS yields have gone negative is because the conventional Treasury yields have dipped to extreme lows, well below the likely rate of inflation over the next 5 years. So there is some logic to buying TIPS, to capture the rate of inflation (even at a slight penalty). And TIPS mutual funds are risky. Eventually the base rate on TIPS is going to climb back toward the historical yield of 2%, and TIPS mutual funds will get clobbered. When the historical yield of 2% returns, would the prices fall by an equivalent amount? Your use of the word clobbered makes it seem they would fall much more severely. Just using the TIP ETF as an example, a rise back to a historical yield of 2% would in fact mean an increase of real yield of about 2.5%, since TIPS yields are currently negative way up the yield curve. (A January 2021 TIPS was going for -0.044% yesterday.) Since the TIP ETF has a duration of about 4.5, a jump to a yield of 2% would cost investors about 10% of their net asset value. I don’t think this is likely in the near future, and that is pretty much the worst-case scenario. So you are right, ‘clobbered’ was stretching it. I suppose a 10% drop in a fixed-income investment could technically be defined as clobbered. I was recently advised by a CFA that at my age, 34, my entire fixed-income position should be TIPS since real inflation was my biggest enemy going forward, and that nominal bonds may not be the best choice. I decided that a 50/50 blend between a TIPS fund and a short-term investment grade bond fund, 3-year duration, was more suitable for my case. You sound very knowledgeable in this area, looking forward to learning more.